This product contains a number of ingredients which have various ways of helping the eyelashes and eyebrows to grow. We believe the directions for using this product also very clear and easy to follow. This review focuses on a product called Suvi Naturals Lash & Brow Serum which is designed to improve the look of eyelashes and eyebrows by helping them to grow out thicker and longer, so that they are more defined. The product contains ingredients that can reduce some of the effects of aging and it can be used on all types of skins. 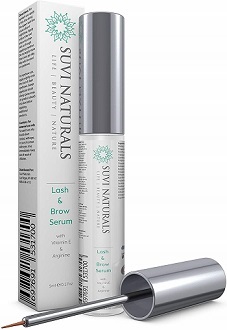 Suvi Naturals Lash & Brow Serum must be applied at night-time. The serum can be applied as a thin line along the upper border of the eyelash or along the root of the eyebrow. Customers are advised to clean the areas before applying the product and to make sure that the product has been absorbed before applying anything else. The manufacturer does not sell their product directly. The product is for sale online from many of the famous online stores. The average price of the product is $20 which affords a 0.17 bottle of Suvi Naturals Lash & Brow Serum. Depending on the online store that the custom users there might be bulk order discounts or subscription discounts yet, we have not noted any on the major websites. The price excludes shipping. The manufacturer offers a money back guarantee despite not selling the product directly. If the customer is not completely satisfied then they may contact the manufacturer within 30 days of the order to arrange a refund. The manufacturer does not state whether they refund for products that are completely empty or partially used. We appreciate the manufacturer’s guarantee but find it to be too short for customers to try the product appropriately. Customers should have enough time to at least finish the product and then wait a few days and then decide if they are happy with the results. This is also why it is important for manufacturers to be clear if they refund even completely used products. This product contains a number of ingredients which have various ways of helping the eyelashes and eyebrows to grow. We believe the directions for using this product also very clear and easy to follow. We appreciate that the manufacturer offers a guarantee but we think it is severely flawed because it’s far too short for the customer try the product and it is obscure. This product is not a bad one but there are definitely better ones out there.